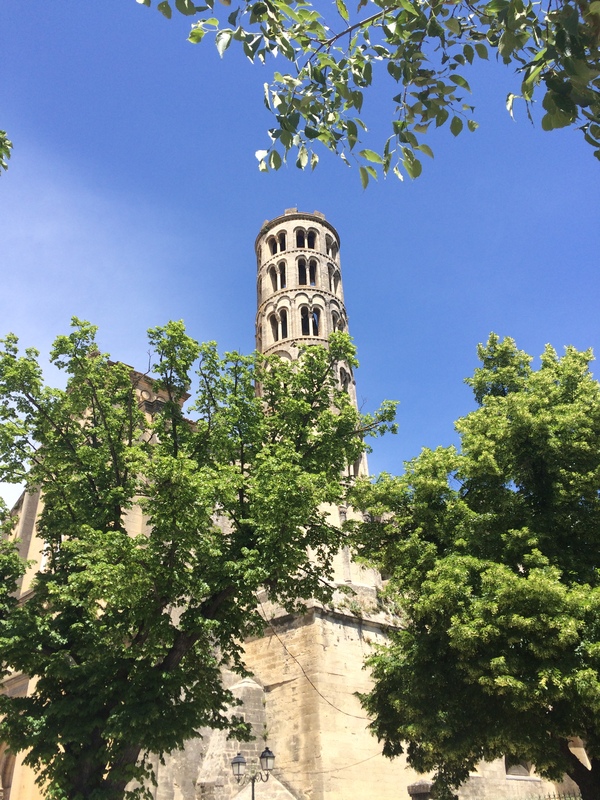 As had been suggested, this morning was bright but windy and a bit chilly, so I thought I would take a break from cycling and head off to the market at Saint-Remy-De-Provence and perhaps then onto Uzes, or the Pont-Du-Gard. 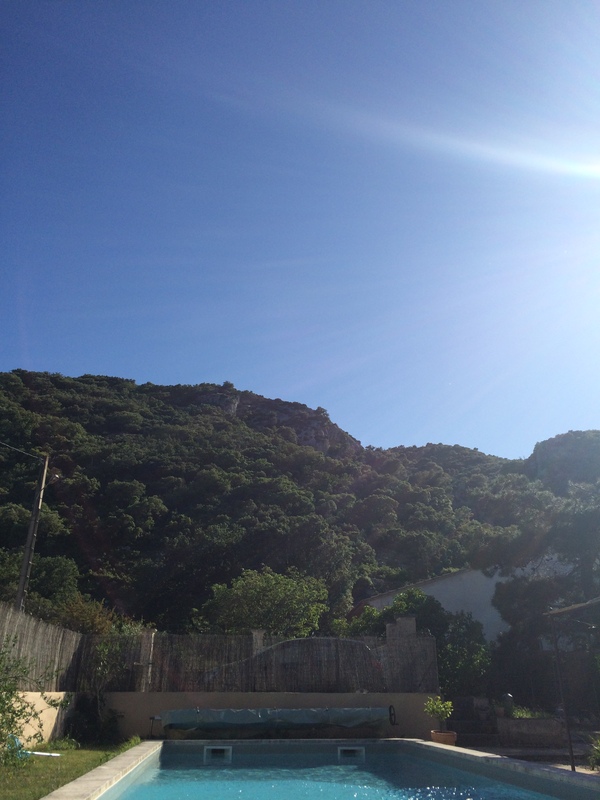 At least a day in the car, doing a bit of sightseeing would give my legs (and derriere) a bit of a rest. I always enjoy the drive across to Saint-Remy, with the sight of ‘Les Alpilles’ rising up on the left-hand side of the road, depicted so beautifully in many of Van Gogh’s paintings. Also great stretches of the road are lined with the Plane Trees that are so evocative of France. I’ve read recently that there is a move to have many of them taken out due to the number of accidents that happen, but I hope that the speed limits, which I noticed were in place today, will prevent it actually happening. As expected Saint-Remy was busy by the time I arrived, even though some of the stalls were still being set up, so I headed off to the Café De La Place, overlooking the main square at the top of the town for breakfast. Again I felt slightly under-dressed as some people seemed to be wrapped up against the elements with padded jackets & scarves, but in my case a T-Shirt and shorts would have to do. It doesn’t seem to matter how many markets I visit, I always see something different or unusual, or something that inspires me. 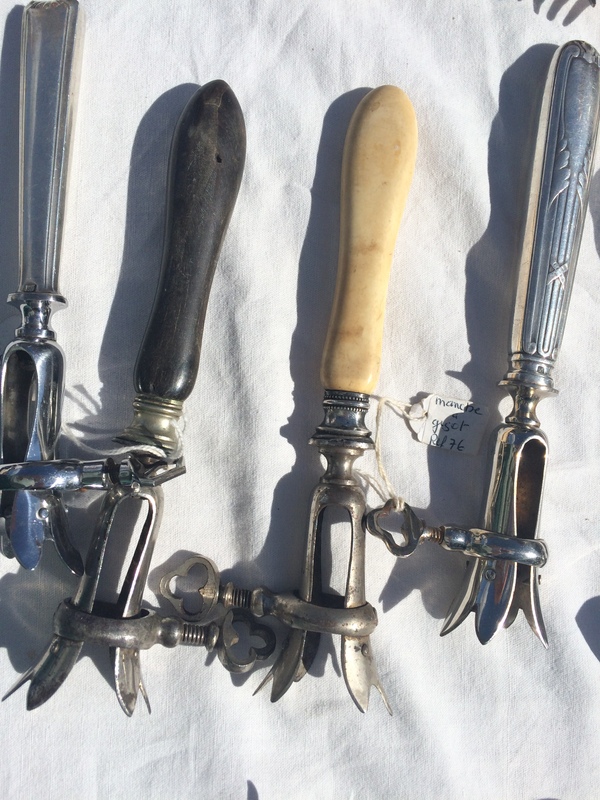 Today’s unusual items are pictured below, they were on one of the Brocante stalls, next to some Asparagus servers, but what their purpose is I haven’t a clue – if anyone can help I would appreciate it. Needless to say nearly 3 hours passed with me hardly noticing the time, helped along by stopping to listen to some of the musicians who set up in courtyards as you wander through the streets – there was one particularly good Jazz Band that had gathered quite a crowd. 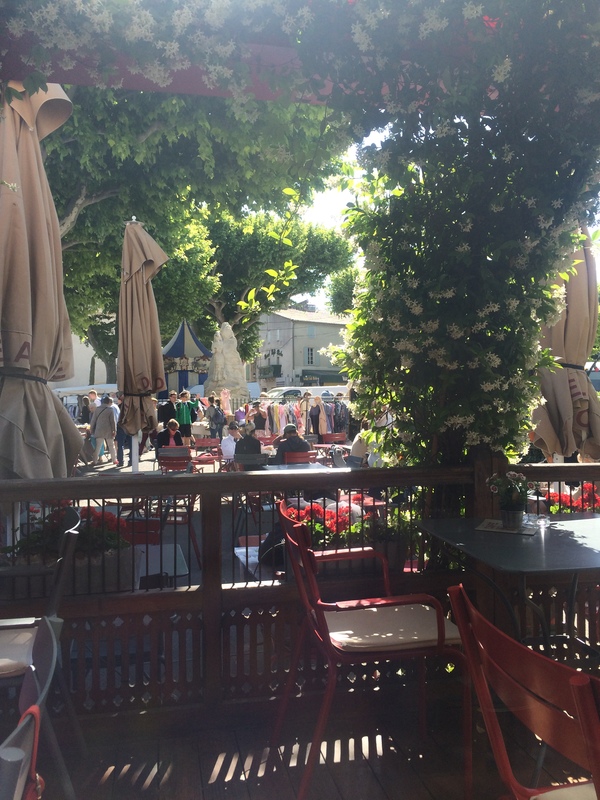 So after buying some supplies for lunch I headed off towards Uzes, stopping for a picnic in the small village of Sanilhac-Sagries on the way across. 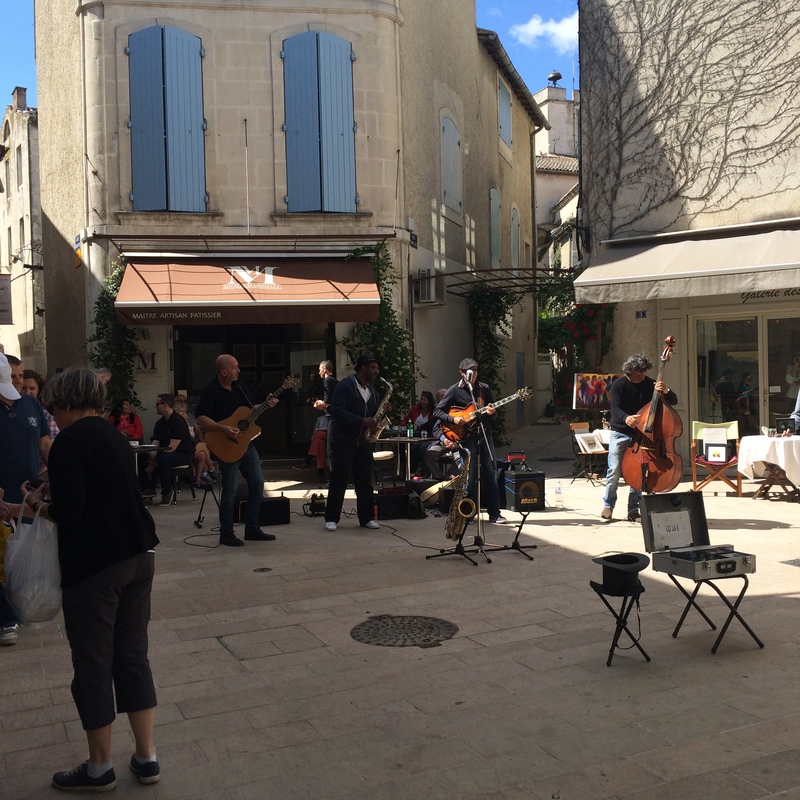 This was my first visit to Uzes and it was enchanting. 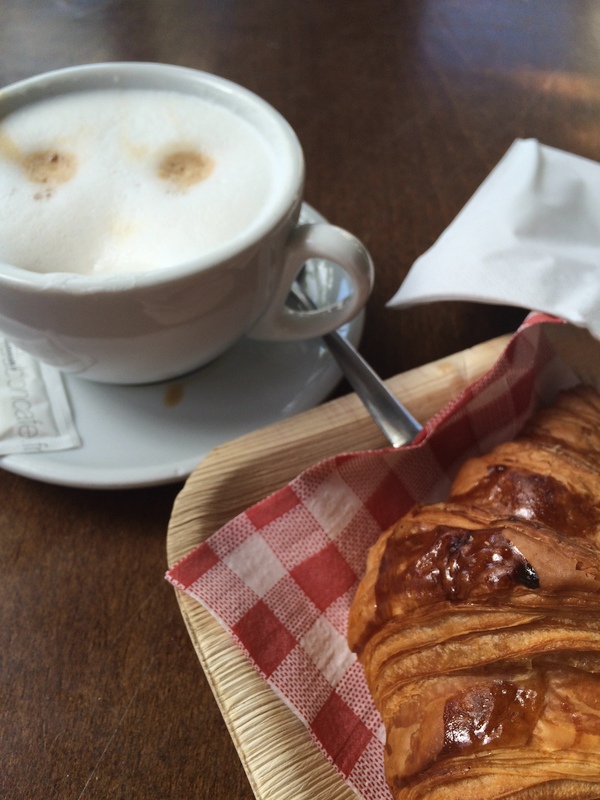 It was quiet and had a real sense of calm after the bustle and noise of Saint-Remy in the morning. The old town rambles upwards through scented,cobbled streets towards the central square. 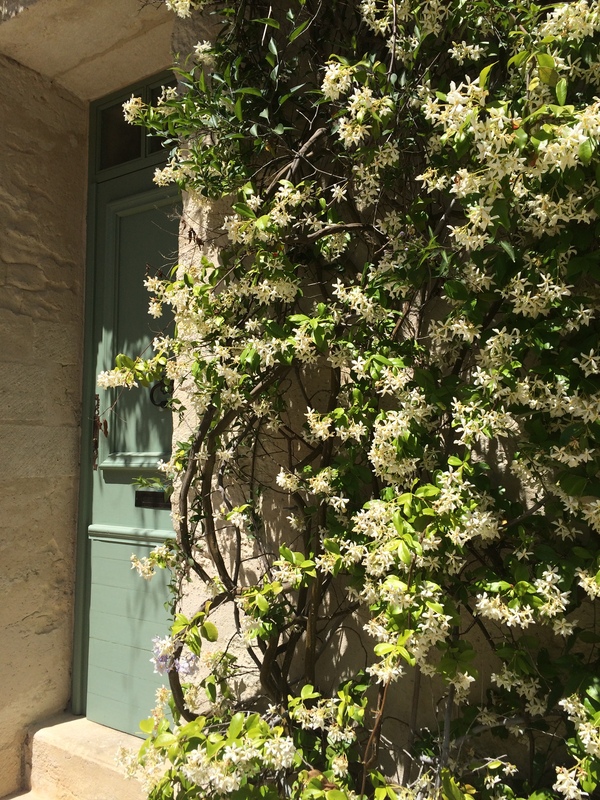 I happened to walk up a street that emerged opposite the entrance to the Medieval garden – the whole street was full of the scent of this Jasmine that was in full bloom around one of the doorways. 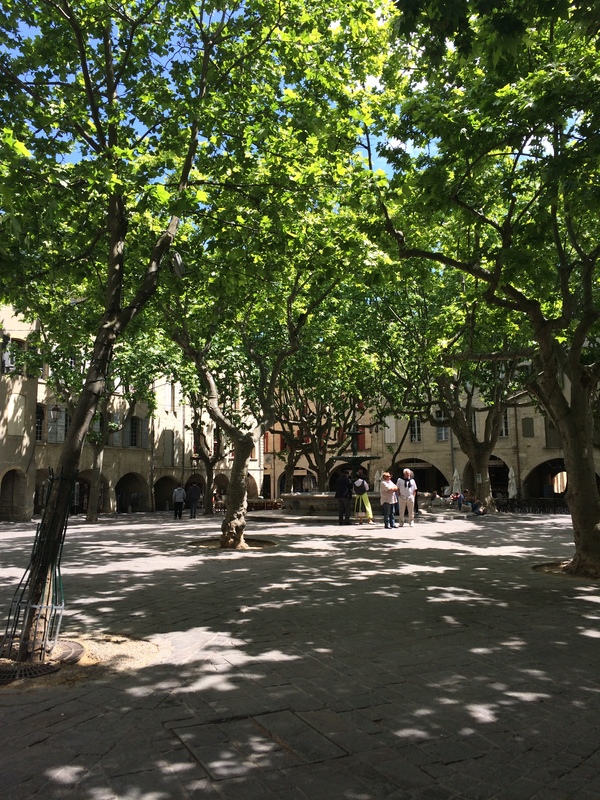 The central square is edged with vaulted walkways, which are now full of cafes with their tables spilling out into the square itself, which is shaded by the trees that give it a beautiful dappled light. At the heart of the old town is the Chateau Du Duche, an imposing building with a beautifully glazed tile roof bearing the Coat of Arms. It is open to the public and more information can be found at www.duche-uzes.com on its history, opening etc. Again I managed to pass a couple of hours just wandering the streets, window-shopping & watching the world pass by, with the help of a rather divine ‘peche blanche & verveine’ icecream from La ‘Fabrique Givree’ on the main square. 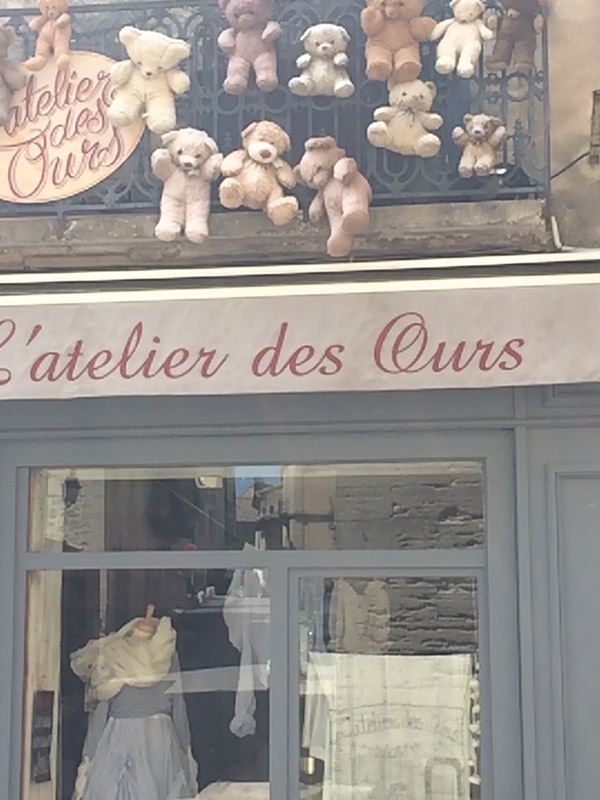 The only thing that I found a little disturbing in the town was the display of bears strapped to the balcony outside L’Atelier Des Ours, I’m still not sure what to make of it! Still not sure this is the best way to display teddy-bears – although it certainly made me look! Sticking on the subject of bears – on the way out of Uzes I passed the ‘Haribo’ Factory and its ‘Musee du Bonbon’ , where I understand one of the exhibits is being able to watch their ‘Goldbears’ being made – Now I don’t advocate bribery, but in this case it is certainly something I may be able to use in the future to encourage the boys to come to the Saturday market with us!! So this evening it is still rather windy, but the sky is a deep blue and the weather forecast looks relatively good for tomorrow – perhaps another day on the bike (with waterproof coat packed just in case) before I get things ready for the rest of the family to join me at the weekend……… when (as they tell me) my peace will be shattered!! Scorchio day here (thurs), spwnt at the county show. Nothing as interesting as those weirdo bits of cutlery. Forks for stcks of rock? !